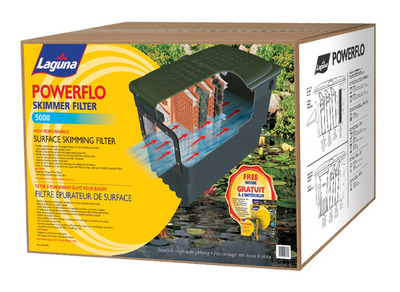 The Laguna PowerFlo Skimmer Filter 5000 is a heavy-duty surface skimmer and filter that provides superior mechanical and biological filtration in ponds up to 18,925 litres (5000 U.S. gallons). Mechanical filtration begins as water flows through the floating skimmer door, which automatically adjusts to the water level, and enters a large chamber basket that collects leaves and large debris. The pond water then flows through the remaining media-containing chambers for additional mechanical, biological and chemical filtration. All chambers have built-in handles for easy removal, cleaning and media replacement. The Skimmer Filter is made of heavy-duty, injection-molded plastic for lasting and durable performance. 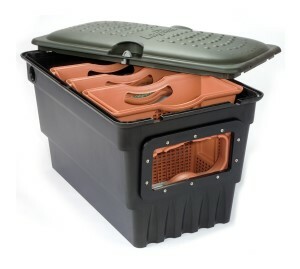 Reinforced lid supports up to 181 kg (400 lbs) and features molded handles, built-in locks and padlock holes.